I was so happy to find out that I have been chosen for a Happy 101 Blog Award! Yeah!!!! Thanks Heathy! Heathy of Adventures of Raw Goddess Heathy Love her blog! 1. The magic in my life! 2. Spending time with my amazing hubby! 3. Having my yoga and spiritual practice in my life, so thankful! 9. Snuggling up on these cold nights with snacks, a movie and of course my husband! 10. There are many more out there that I love and would have liked to nominate, but they have already been nominated. But still I would like to give the shout out 🙂 Kristen, Lauren, Carmella, Joyce, and Diana just to name a few. And your blog is beautiful too; so uplifting! SO sweet thanks!! It is my pleasure, I love seeing your new posts all the time! So honest and uplifting too!! thanks for the nomination! how cool! and happy new year to you! Thank you so much. What a nice way to start the new year! Oh my gosh, I’m honored to be included in such a list of amazing bloggers. Thanks so much Marisa! Heather, of course I had to include you!! We do have tons in common, probably why I love your blog so much! Gasp! Thank you so much! I’m so honored to have gotten this award not once, but twice! I’ll have to add that to the list of things that make me happy! Heheh so much love!!! Awesome! Enjoy the award, you super deserve it!!! You are so inspiring! I was so happy to be able to send this to you! Thanks! I love your blog! It was my pleasure! thanks!! Loving the list!!! Great stuff! Awesome, thanks! Your blog is fabulous too!! 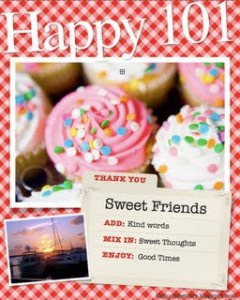 Trackback: Making Love in the Kitchen » Blog Archive » Happy 101, Here We Go. Top Site! Continue the fantastic work! Thank you!!! Sorry, your comment went to Spam and I just saw it 😦 But thank you so much! Thank you!!! So sweet!! Sorry, your comment went to Spam and I just saw it 😦 But thank you so much!